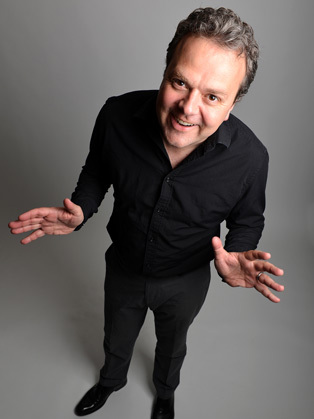 Over the last year Hal Cruttenden performed on ‘The John Bishop Show’ (BBC1) and ‘Live at the Apollo’(BBC1 and 2), which was his third appearance on that show, ‘The Melbourne Comedy Festival Gala’ on Channel 10 Australia as well as making a third appearance on ‘Have I Got News For You’ (BBC1), he is frequently seen on ‘Great British Bake Off – Extra Slice’ (BBC2), including this year’s final, appeared on ‘The Apprentice You’re Fired’ (BBC2), again on the final show too, and performed on ‘Channel 4’s Comedy Gala’(C4) in aid of Great Ormond Street Hospital in front of an audience of 16,000 at the O2 Arena, London. Hal also took part in the ‘Hell on High Seas’ challenge’ where six celebrities and a professional crew sailed from Belfast to London on a Volvo 65 Racing Yacht facing very rough weather and sea sickness to raise over a million pounds for Sport Relief. Their progress was shown each night on ‘The One Show’ (BBC1). Hal continues to tour his latest show ‘Straight Outta Cruttenden’ throughout the UK until the end of the year and includes runs at both the Edinburgh Festival and the Melbourne International Comedy Festival. This is his fourth tour following the highly successful ‘Tough Luvvie’ (2013/14) which was released on DVD at the end of 2015 and ‘The Tiny Rage Tour’(2011) and ‘Lively (2010). He is also a three time Chortle Award nominee and was nominated for the Perrier Newcomer Award in Edinburgh back in 2002. Other TV appearances include ‘The Royal Variety Performance’ (ITV), ’Would I Lie To You’ (BBC1), ‘Kevin Bridges: Live at the Referendum’ (BBC1), ’Sunday Night at the Palladium’ (ITV), ‘Mock The Week’ (BBC2), ‘Celebrity Squares’ (ITV), ‘Pointless Celebrities’ (BBC1), ,’Michael McIntyre’s Comedy Roadshow’ (BBC1), ‘Celebrity Mastermind’ (BBC1), ’Comedy Rocks’ (ITV), ‘John Bishop’s Only Joking (Sky One), ‘The Rob Brydon Show’ (BBC2), ‘The Wright Stuff’ (Channel 5), ’The Omid Djalili Show’ (BBC1), ‘The 11 O’Clock Show’ (Channel 4), ‘Comedy Central at the Comedy Store’ (Comedy Central), ‘Just For Laughs Gala’ (CBC Canada), ’Funny as Hell’ (BBC America), ‘George Stroumboulopoulos Tonight’ (CBC Canada), ‘Brain Candy’ (BBC3), ‘Live at Jongleurs’ (UK Gold/Paramount), ‘The Comedy Store’ (Paramount), ‘The World Stands Up’ (Paramount Comedy Channel UK, The Comedy Channel Australia, Comedy Central and BBC America). His radio sitcom ‘Hal’ is currently being repeated on Radio 4 and a second series has been commissioned to be broadcast by the end of the year. Other radio appearances include being team captain on ‘Britain versus the World’ and spots on ‘Loose Ends’, ‘Act Your Age’, ‘Chat Show Roulette’ and ‘Four at the Store’ (all Radio 4). He can also frequently be heard on Radio 5 Live where he has appeared with Richard Bacon, Nicky Campbell, Nick Hancock, Victoria Derbyshire and Stephen Nolan. Internationally, Hal’s currently appearing in Australia at the Melbourne International Comedy Festival. He’s travelled across Canada on the Just For Laughs Comedy tours. He has appeared at two Just For Laughs Galas in Montreal hosted by Joan Rivers (2008) and Howie Mandel (2012). He has also done shows at the Kilkenny Cat Laughs Festival in Ireland and performed live in India, Bermuda, the Netherlands, Switzerland, Belgium, Germany, Denmark, Norway, UAE, Qatar, Kuwait, Bahrain, Indonesia, China, Hong Kong and Singapore. For the British Armed Forces he has played gigs in the Falkland Islands, Cyprus and Germany.